Being Single doesnt mean that you are unwanted or undervalued. It means that you are well aware of your worth, and that you will not lower your value for anyone. S.H.E. 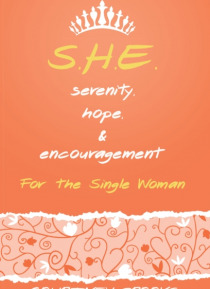 for the Single Woman is designed to empower and to help enhance the confidence of single women all over the world. Through readings that will strengthen your inner being and challenge you to focus on your goals as you await the arr… ival of your King. Courtney Brooks has provided tools that will help you to gain insight into understanding who you are, and to increase your perspective on dating and love. S.H.E. for The Single Woman will expand your happiness by opening your mind, and soul to new ideas that will make the time of being a single woman enjoyable.